Dhaka, 31 Mar, Abnews: The UN Secretary General, Antonio Guterres, has called for an independent investigation after Palestinian officials said 16 Palestinians were killed in clashes with Israeli soldiers on Friday. Hundreds were also injured on the Gaza border, the Palestinian side said. Friday was the single deadliest day in the Israel-Palestine conflict since the 2014 Gaza war. The UN Security Council condemned the violence after an emergency session. UN deputy political affairs chief Taye-Brook Zerihoun told the council the situation in Gaza “might deteriorate in the coming days” and called for civilians, particularly children, not to be targeted, Reuters news agency reports. “Israel must uphold its responsibilities under international human rights and humanitarian law,” he said. In a written statement before the meeting, Israel’s ambassador to the UN, Danny Danon, blamed the bloodshed on Hamas – the militant group that controls the Gaza Strip, a Palestinian territory. Palestinian President Mahmoud Abbas said the Israeli authorities bore “full responsibility” for Friday’s deaths. Why was there tension at the border? Thousands of Palestinians marched to the border at the start of a six-week protest, dubbed the Great March of Return. They were demanding that refugees be allowed to return to their homes in what is now Israel. Palestinians have pitched five camps near the border for the protest, from Beit Hanoun in the north to Rafah near the Egyptian border. Israel’s military, which oversees a no-go zone along the Gaza border, doubled its troop presence for the protest. 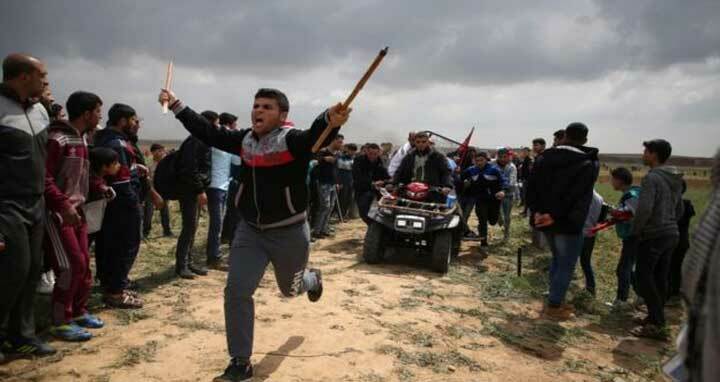 The country’s foreign ministry called the gathering a “deliberate attempt to provoke a confrontation with Israel” and said that “responsibility for any clashes lies solely with Hamas and other participating Palestinian organisations”. What do the two sides say happened on Friday? The Israel Defense Forces (IDF) said there were about 17,000 Palestinians in five locations near the border fence. It said it had “enforced a closed military zone” in the area around Gaza. Although most protesters stayed in the encampments, some groups of youths ignored organisers’ calls to stay away from the fence and headed closer to Israeli positions. The IDF said troops were “firing towards the main instigators” to break up rioting, in which petrol bombs and stones were thrown at the fence. The Palestinian side accused Israel of using disproportionate force. Tanks and snipers were deployed, and witnesses said a drone was used to drop tear gas in at least one location.